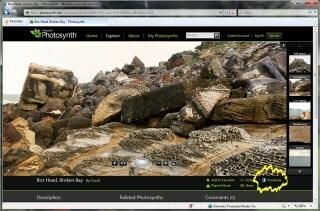 Matt of the HDView blog recently showed off another cool feature of Photosynth – Photosynth slideshows. In addition to letting you make amazing 360 degree images like you saw on CNN’s “The Moment” project, you can also stitch together unconnected photos to create a clickable slideshow around a particular subject or theme. You can see an example of how this works in the Photosynth slideshow of people watching Obama’s inauguration. The images in this collection were crowdsourced from the numerous photos that people uploaded of themselves watching the event on TV. The slideshow itself is pretty great (to see the next image, just click on the synth to proceed), but it also shows off a feature of Photosynth that I wasn’t aware of until now – you can use Photosynth to create interactive presentations! In these sorts of slideshows, images are combined but aren’t being used to create 3D views of an area or scene. Yet the results are still pretty cool.